Fancy Pants Children's Resale Boutique – Quality children's clothing, toys, and equipment, without the fancy price! A small, family owned, second hand boutique that specializes in children’s apparel. 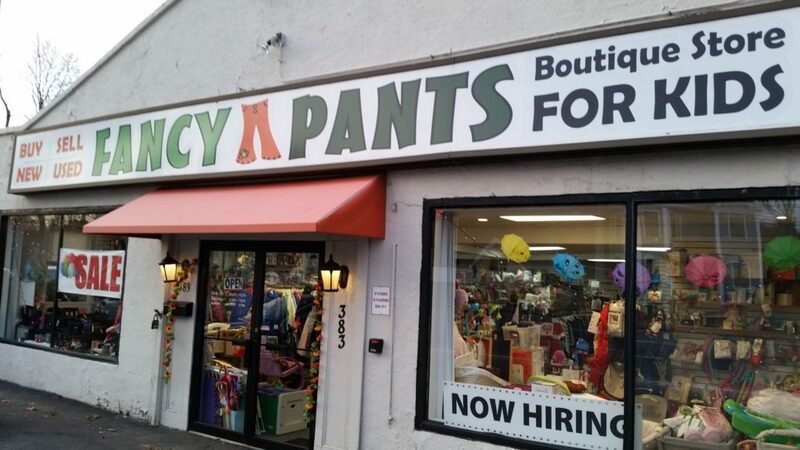 Located in Newton MA, Fancy Pants is a small, family owned, second hand boutique that specializes in children’s apparel. We buy and sell gently worn clothes and shoes, and gently used toys, books, strollers, and much more. Children grow fast, but our mission is to prolong the life of the memories you’ve built by making the goods you no longer need available to others. We take pride in what we do and are here to help. We hope you’ll stop by as a buyer and/or seller. Do you want your kids in the latest fashions and the most popular brands? Love Fancy Pants! I came and bought a TON of stuff for my daughter. This being my first child, I had a lot of clothes needed for the first few months, but not for as she got older – so it was great to be able to buy them at a discount as they grow out of them so quickly. Marina, the owner, was super helpful – identifying some great brands and helping me think about future seasons and what I may need for those. I bought at least two bags worth of clothes for less than $100 – which is a steal! Will be going again soon! I’ve shopped at Fancypants a few times now to find gifts for friends and their children. I love walking around the store and seeing young children interacting with the products and the toys/books. Additionally I have never had any issues finding wonderful clothing in great shape for kids of all ages/sizes. I can’t imagine paying 50.00 for a newborn’s outfit when I can get the exact same item at Fancypants for 7. The staff have always been super friendly and, now that I’m pregnant myself, I look forward to continuing to shop at the store for my own future kiddo. My daughters and I have relied on Fancy Pants (Children’s Orchard) for many years to provide quality clothing, furnishings, accessories, books and toys for my grandchildren. As they grew, we also were happy to be able to recycle their quickly-outgrown clothes, strollers, and other lightly-used kid stuff. Linda and her staff were always pleasant and fair, so it was a pleasure to shop and sell there. Now that our kids are teens and too big/old for their products, we miss them a lot. I recommend them highly!